The Stanley 1-70-316 One Touch Toolbox has a heavy-duty design and extra width soft grip handle on top for easy lifting. It has a one-touch latch for easy opening of the toolbox. 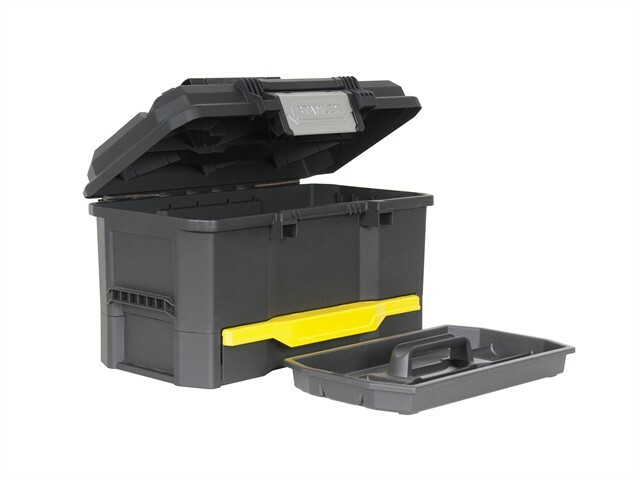 It has a 2/3rd removable tote tray which allows enough space for large tools to be stored underneath and a deep drawer with ball bearing slides for versatile organisation of various sizes of tools and small parts. It has a V-groove in the lid, which is suitable for use when cutting timber or pipework and an integrated padlock eye for securing tools and contents. Dimensions: 48 x 28 x 29cm.